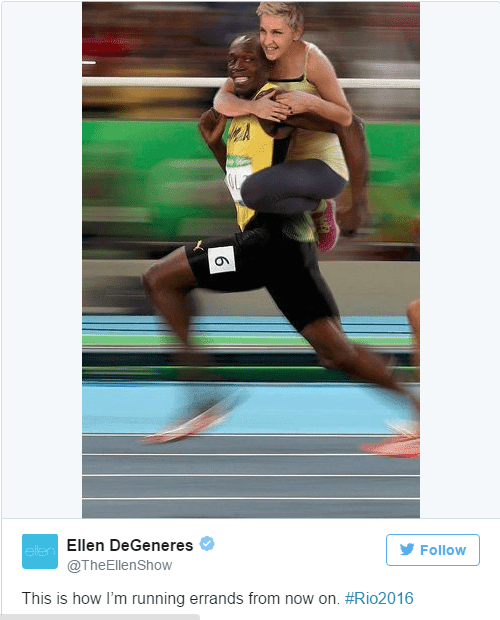 Elen DeGeneres says she's not racist after receiving backlash on social media for posting this edited photo of herself riding on the back of Jamaican sprinter Usain Bolt. The talk show host said Tuesday on Twitter that she's "highly aware of the racism that exists in our country" but that's "the furthest thing from who I am." DeGeneres had posted the photo Monday with the caption: "This is how I'm running errands from now on." "Imagine a white man Photoshop himself riding Elain Thompson," posted one critic. Usain Bolt apparently had no problem with the image himself cos he retweeted it to his 4.2 million followers. Did you find the photo offensive though?